Increase sales and reduce phone time by making it more convenient for your customers to place orders online. Increase order size. Online meal orders are 15-30% larger than phone-in orders as customers order at their own pace from your full menu, with all drinks, desserts and side dishes tastefully offered. Increase customer satisfaction and accuracy as customers comfortably choose their options and then effortlessly send their orders directly to your computer or fax. EASY: Orders instantly show up on your computer or in your fax... Employees can be taught our system in minutes. One click and your customer is sent a confirmation email. In less than a minute, you can change a price, add a new item or post a special on your chalkboard. Easy. Very easy. RELIABLE: Successfully handling customers all over the world... Developed over two years working closely with the owners of independent restaurants and food service consultants. Satisfaction Guaranteed! FLEXIBLE: Works well with takeout, delivery, and even catering... Maintaining your website is a snap; no webmaster needed. Hundreds of extra features fulfill the unique needs of independent restaurants. AFFORDABLE: For a few dollars a day you can have your own website, be your own webmaster, and offer your customers a state-of-the-art online ordering experience... Talk to your account manager about local pricing and special rates. It pays for itself almost immediately. Call your local rep or our National Office: 866.524.7714. Based on your needs, a solution is proposed. Sign-up with your rep or over the phone. 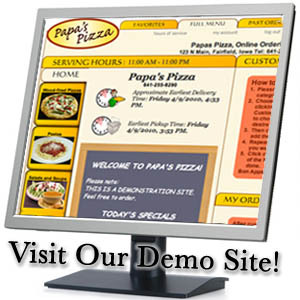 After we review your menu, your site can be up in 24 hours. We customize your online menu with your logo, photos, etc. Tell your customers. It's easy with our promotional materials, personal support, and training. Orders come to your PC or fax.